Looked on piketrace and found this rig out.....looks very intresting...has anyone ever used the rig???????? 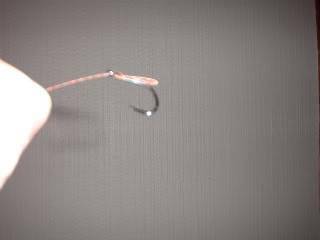 but remember ya have to watch what ya doing useing single rigs because there is a reel chance of deep hooking a fish! but some times it can be the only way to get a bite! 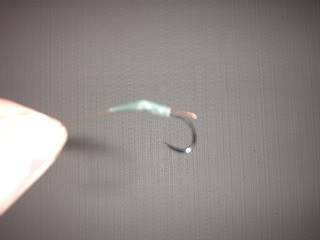 my mate used the method on the river afta blanking in the same spots useing normal rigs! so he tryed a single sprat and hook rig hooked through the lip in the same spots 20mins later he had a bite witch he struck into real quick! couldnt believe it! MrMakk wrote: Lokked on piketrace and found this rig out.....looks very intresting...has anyone ever used the rig???????? if you use the 2 single rig be carefull setting up, as the hooks appear to hook into anything and everthing, until they are in the bait. It's basically like a hair rig. And here's my first Pike caught on it. Nine times out of ten they'll be hooked in the scissors. Nice and easy to unhook! what method would you use with the rig....ledger(alarm setup) or float.....also if it ledgering....what weights would u use? It's mainly used for ledgering which can be a free running lead or a float ledger rig. As for weight of leads there's already a post on peoples preferences. Some like a minimum of 3oz and some like as light as they can go. 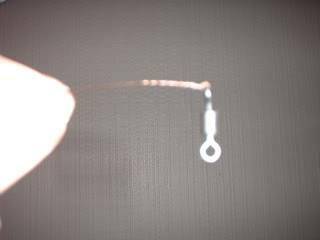 I've sent you a PM on a forum thats discusses single hook systems in more detail. MrMakk, I am also a member at the forum that nightwatchman is talking about. I have always used singles for my pike fishing and I have 4 rigs that I carry in my kit. Rig number 1 has a single hook of size 2/0 and one of size 4. The size 4 goes into the root of the tail, straight through the bone, and the size 2/0 goes into the flank and back out so as to expose the hook point. I tend to use this for larger baits and/or distance fishing. 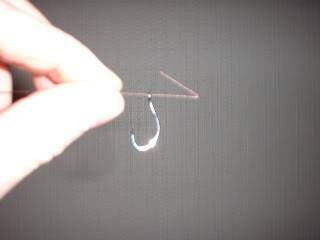 The smaller hook acts as an anchor to hold the bait during the cast. Rig number 2 has just the size 2/0 hook for close in/margin work with a large bait. This is hooked through the root of the tail. Rig number 3 has just a size 4 hook attached and is again for close in/margin work but with a small bait. Again hook goes in the root of the tail. Rig number 4 is the tagging rig. This has a size 4 hook and is attached to the trace using a knotless knot tied over a 'loop' made in the end of the wire. 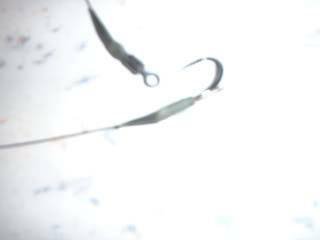 Through this loop I pass the nozzle of a 'gun' which in turn gets pushed through the root of the tail on the bait fish and a plastic tag 'fired' through. The tags in question are the exact same type that hold labels on to items of clothing. I always use the early strike method and GOOD bite indication is a must. This is because (my opinion and not proven in any way) I feel that the pike doesn't feel the hooks and there is less chance of them being seen so the pike has no qualms about swallowing the bait there and then. I use all of my rigs legered and float legered. I have had a disastrous season so far so I cannot comment on the effectiveness of the tag method. However, if you visit the other website, you will see that people do have success and have landed some good fish. There will always be people who pull down the use of singles and swear by the use of trebles. All I can say is 'Each to their own'. If people are confident in using trebles and can safely use them, then carry on using them. I personally much prefer singles as I feel they offer a safer and kinder way of fishing if used responsibly and correctly. I also find unhooking very easy. I have only ever had one deep hooked pike and this was due to not paying full attention. All I can say is, I'm glad I had barbless singles. The pike was returned safely and swam away strongly after a short rest in some reeds alongside where it was returned. For those who are interested, here is my way of creating a tag method trace. First of all can I apologise for the pictures. My camera is a fair few years old now and only 1.3Mp and not very good at close up's but you should get the jist of things. Also, I'm no David Bailey . Wire cutters, hooks, trace wire, twiddling stick (not necessary but makes life easier), rig sleeves and a swivel. Using the cutters, remove 2ft of wire from the roll (I use the depth of the kitchen worktop as a guide) and bend one end over approximately 1". 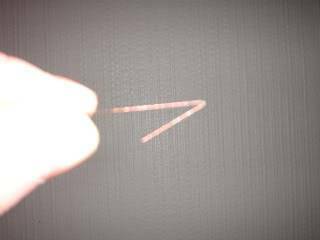 Thread your trace wire through the back of the hook's eye. 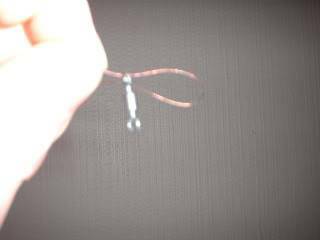 Make sure that the end of the wire is at the very top of the shank and tie the knotless knot. 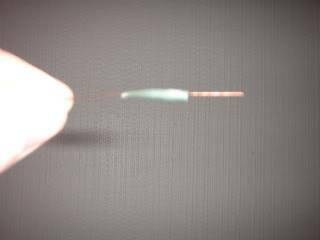 I do 10 turns around the shank before passing the wire back through the back of the eye. 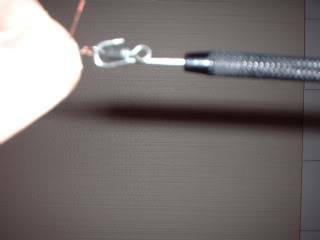 This gives a really strong and secure hold and if done correctly leaves a 'loop' of wire below the knot running down the shank of the hook. From the other end of the wire, slide on a rig sleeve and pull over the coils, leaving the 'loop' exposed. Now we attach the swivel at the other end of the trace wire. My preferred method is the twist method but you can crimp if you want. Slide on a rig sleeve, not forgetting to get it the correct way around if using tapered ones like I do (wire goes in the thin end first). Pass the trace through the eye of a swivel then back through the opposite way to create a loop. Put your swivel through the loop and pull tight. This locks it in place. 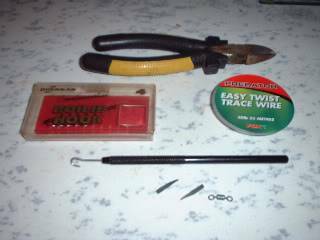 Using the twiddling stick, place the hook into the same eye as the trace wire and hold the wire with the tag end at 90 degrees to the main wire and spin the twiddling stick slowly to wrap the tag end around the main wire. Maintain a fairly tight grip on the wire to create a neat finish. Slide up your rig sleeve to finish. The total finished length should be around 20" which I think is ideal. Don't worry as, the 'kick' at the hook end can aid in hooking. Just ask anybody who goes carp fishing . Lefty wrote: MrMakk, I am also a member at the forum that nightwatchman is talking about. Pics could have been sharper but that's down to not owning a better camera more than anything. Lefty wrote: Thanks for the comments guys.